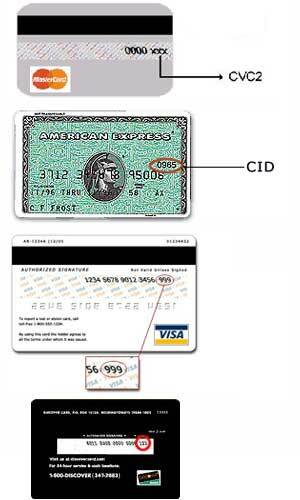 What is your Card Identifier # or CVV2/CID? This number is recorded as an additional security precaution to ensure that your credit card information is not being used fraudulently. This number can be located in different spots on your cards. On Visa, MasterCard and Discover the Card Identifier # or CVV2/CID number is the last 3 numbers on the back. On American Express it is located on the front. CVV2 stands for Card Verification Value, sometimes referred to as CVC2 (Card Verification Code). It is the last 3 digits following the credit card account number within the signature panel on the back of the credit card. CID stands for Cardholder Identification Code. It is the 4 digit value above and to the right of the credit card account number on the front of the credit card. This is an additional measure to protect our customers from fraudulent transactions. The CVV2/CID can only be found on the card itself. A transaction created with a valid CVV2/CID means that the person requesting the transaction must have the actual card in his/her possession. Many financial institutions now require this code for verification.